For some students, it’s not enough to excel and establish a strong presence in the classroom or in the workplace, they want to connect directly with the industries they have been exposed to and demonstrate the skills and professionalism they have to offer to their future peers. This fall alone, a strong contingent of Rowe School of Business students have actively participated in industry events, and business leaders in cities across Canada and beyond are taking notice. This September, 2nd year Corporate Residency MBA (CRMBA) student, Alison MacPherson, had the opportunity of a lifetime, and she didn’t want to waste it. Her 8-month internship with Novartis Pharmaceuticals Canada Inc. as a Health Economics & Reimbursement Strategy Trainee was winding up and she was due back on campus to start her 2nd year of the MBA program in September when she got the news that she was 1 of 10 students in the world, and the only student from Canada, to be awarded the 2017 Student Travel Grant by the International Society for Pharmacoeconomics and Outcomes Research. 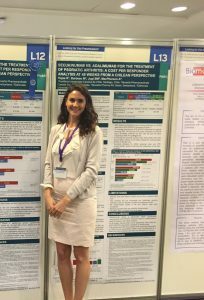 The grant enabled her to attend and participate in their Latin America Conference, from September 16th-17th in São Paulo, Brazil and attend Novartis Brazil meetings afterward. It was Alison’s hard work and collaboration during her work term with Novartis that lead to her co-authoring 28 abstracts. At the conference, she, and other Novartis team members presented 14 posters, primarily on Ankylosing Spondylitis, Psoriatic Arthritis, and Chronic Heart Failure. I felt very fortunate to attend this conference in Brazil. Networking, attending short courses, presenting, and attending regional workshops and meetings was a tremendous learning experience. 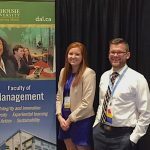 On September 14, Bachelor of Commerce students Bryce Cross and Molly MacDonald presented to financial services professionals at the Institute of Advanced Financial Planners (IAFP) symposium in Winnipeg. Their presentation, titled “Can a Robo-Advisor Meet Client Needs Over the Entire Client Lifecycle?” explored what robo-advisors are capable of and whether they can be expected to adapt over time to meet changing client needs, and looked at the relationship between technology and gender. The presentation followed Cross and MacDonald’s win at IAFP’s Student Financial Planning Competition in May of 2017, where they submitted a précis and video presentation on the topic and received top marks from the panel of four judges. It’s exposed me to dozens of employment and personal growth opportunities that I couldn’t have gotten in the classroom or at other case competitions,” Bryce says. “It’s been one of the most influential experiences of my undergraduate education. But this was not the first time Cross had delivered a presentation to this crowd. 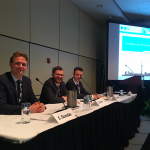 He, along with his classmates Sam Dundas and Kyle Maclean had won the opportunity to present to the IAFP in 2015 in Niagara, Ontario, on the topic of how financial planners and advisors can appeal to millennial clients. Their presentation in Niagara not only earned them a standing ovation from the crowd, but paved the way for invitations to speak at a wealth management firm in Calgary, deliver an interactive session on “The Millennial Generation on Trust & Advice,” to the Society of Trust & Estate Practitioners (STEP) in Toronto this past summer, and present a talk on “Advising Millennial Clients” to the Halifax Estate Planning Council in October. Every engagement has come to us and we’ve just said yes to everything. We’ll be off to Saskatchewan during the winter semester for another engagement. Earlier this month, the Americas’ SAP Users Group (ASUG) hosted their Atlantic Chapter event at Dalhousie followed by their Ontario Chapter meeting a few days later in Mississauga. With guidance and encouragement from award-winning professor of Management Information Systems, Michael Bliemel, Rowe School of Business students impressed the delegations attending both of these events by demonstrating their skill and leadership abilities to a range of SAP customers, consultants, and partners. The ASUG Atlantic event included a visualization hackathon using data from the Royal Canadian Navy and Climate Atlantic, resulting in CRMBA students Priyanka Kochhar winning the top spot, and Justin Zuccon being named the runner-up. Later that day, CRMBA student Emma McGinn, a member of the ASUG Atlantic Chapter board as University Liason, moderated a panel discussion she had organized for the event on student career advice. Emma invited professionals from the public and private sector, including organizations such as the Nova Scotia Health Authority, the Nova Scotia Government, and IBM, to comment on SAP-related career opportunities and share insights with the student audience into their work, field, and navigating recruitment processes, among other topics. Having the opportunity to organize the panel from start to finish and see it successfully come to fruition was a great moment. 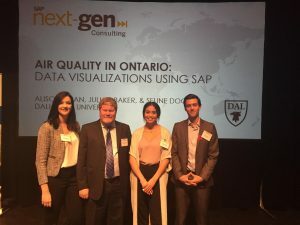 This experience gave me valuable knowledge to use in the future, as well as making great connections with individuals in the field of SAP from across Canada. I think I speak for all of us on the team when I say the opportunity to travel to Toronto and showcase our knowledge and skills was a highlight of our university careers. The competition pushed us to apply the theoretical knowledge from Michael’s class and turn it into real-world problem-solving. The Dalhousie Real Estate Association (DREA) was established only two years ago, but what they may lack in history, they make up for in ambition. The event, which was fully funded thanks to DREA’s success in securing corporate sponsors, encompassed two panel discussions and a networking social. The panels, entitled ‘Emerging Leaders’ and ‘Executive Strategy’ were made up of analysts and executives from such Canadian commercial real estate firms as Kingsett Capital, TD Real Estate Investment Banking, Oxford Properties Group, GWL Realty Advisors, Slate Asset Management, InterRent REIT and Deloitte’s Real Estate and Construction division. 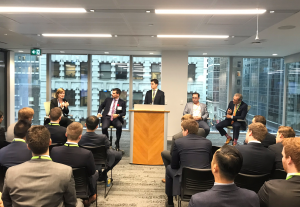 Held at Deloitte’s Canadian headquarters in downtown Toronto, the event brought together more than 50 undergraduate attendees from Dalhousie, Queen’s University, University of Guelph, Western University, Laurier University and Ryerson University. It was definitely a rewarding event for everyone involved. The panel discussions represented a structured learning opportunity, providing direct real estate insights from industry veterans and emerging leaders. At the networking social members were able to make meaningful connections with industry partners and also benefitted from meeting like-minded students at some of Canada’s top universities. Since then, DREA members were sponsored by CBRE Atlantic to attend their market outlook breakfast on Nov. 16 in Halifax. There is no question that our students value experiential learning opportunities and are keen to take full advantage of them. Your industry’s next professional event may serve as the perfect occasion to connect with our students and see their talent in action. Please contact Management Career Services for assistance with enhancing your talent attraction strategy.